President Benigno Aquino III stood firmly about his conclusive analysis that SSS will be bankrupt in 2027 if the pension increase for retirees will be persuaded. According to PNoy, he rather be called 'heartless' than 'irresponsible and heartless' for not sustaining SSS funds. Furthermore, he added that he could actually score pogi points right now by approving the pension hike which will help him promote his candidates to the upcoming elections since he would probably be forgotten and not be blamed in 2027. But instead, he chose to safeguard SSS's future. Moreover, PNoy said in a press conference held in Bulacan that his decision was not capricious instead he considered the welfare of SSS and the majority of its members. He even mentioned that although 2.15 Million SSS pensioners will benefit from the house bill, the remaining 30 Million members will suffer thenafter. Communications Secretary Herminio Coloma Jr. even backed up PNoy's decision and said that instead of the funds will last until 2042, it will only be until 2027 if the house bill will be approved thus jeopardizing the entire Social Security System and its members. Coloma stated that SSS is currently looking for alternative benefits to provide to its members in replacement of the HB 5842 like the Php500 increase which is more feasible than the Php2000 increase according to Aquino. 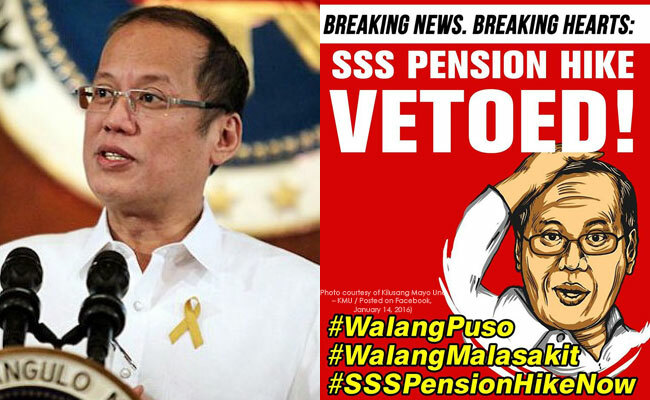 After PNoy vetoed the pension hike, a lot of SSS members, especially the senior citizens and retirees, protested against the president's decision and called him 'heartless'. With the current pension rate of Php1,200 minimum, members said that it wasn't even enough for their monthly medication and the pension hike would have been a great help. The House Bill 5842 proposed an additional Php 2000 per SSS pensioner monthly. The bill was approved by the House of Representatives on June 2015 and was adopted in the Senate on November of the same year. Meanwhile, netizens could not help but to give commentaries regarding the issue especially when a photo representation of SSS officials' salary was posted. 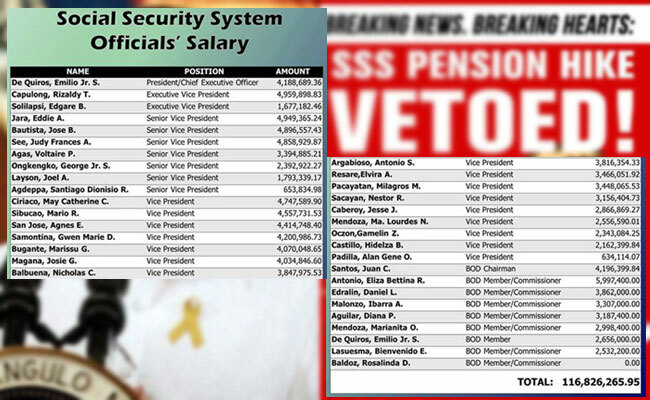 According to some, how could an SSS Vice-President earn more or less, 2.5 Million but could not suffice an increase to its members who actually are the main source of its funds?